Urban Cusp magazine is a “cutting-edge lifestyle magazine highlighting progressive urban culture, faith, social change, and global awareness. It was started by Rahiel Tesfamariam, a powerhouse of vision with the energy to execute on it. 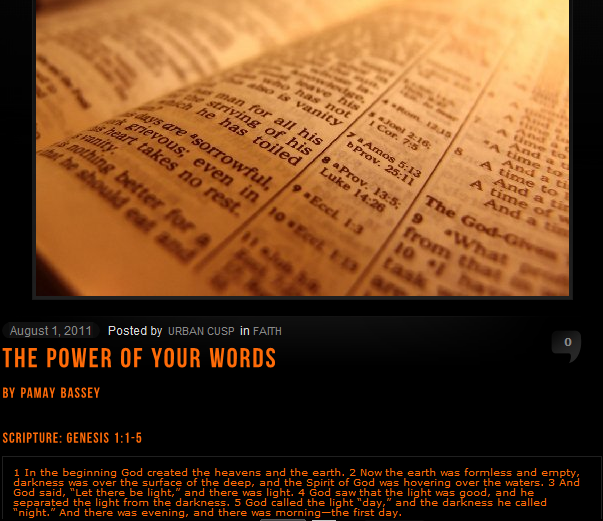 Faith is a central tenet of the Urban Cusp magazine,and for the August 1st issue, I was invited to contribute a devotional called “The Power Of Words,” based on Genesis 1, and my visit with my mother and my sisters in November, 2010 to the Trinity Center for Spiritual for Living. You can read the entire devotional at: Urban Cusp.